Much like with most blog posts that I write, this Epistolary post was slated much earlier, preferably on the first week of April but then I got lazy, and then I lost interest, and then I forgot entirely. Story of my life, really. Anyway. A couple of things has happened in the past month and more than once I found myself opening a new post to write down my thoughts and such but then I realized that no one but me really cares about my personal life so I’d close the window and file the idea away. Thank goodness I have this little blog series so I’ll have an excuse to write about my mundane existence. Took a fully unintentional break for nearly two three weeks and now I have no idea how this blog contraption works. To be fair, I never really did figure out how to blog properly so this sudden disorientation isn’t actually out of the norm for me. Sometime last year, I finally got myself to read Julie Murphy’s Dumplin’. Suffice it to say, I laughed, cried, ugly cried, and made me rethink what it really means to love yourself. I mean, sure, it’s easy to say that everyone’s beautiful no matter their shape or size but to read about a teenager fighting to prove to everyone and to herself that she truly believes that she’s beautiful is hardly comparable. After reading that kickass book, I knew I had to read the sequel, Puddin’, which was about two minor characters in the first book. Dumplin’ was an emotional rollercoaster that left me feeling warm and giddy. But did the second book do it better? March has gone and went with barely a word of warning. I swear I was just complaining about how sudden February ended and now here I am, complaining about how March breezed by. Clearly, I need to improve my time management skills, maybe then I’d finally be more aware of how long a month lasts. Anyway. I’m not normally the kind of person to prepare a TBR list at the beginning of the month. Heck, I’m pretty much notorious for overpiling my TBR shelves. However, this year I’ve made it a practice to come up with a reasonable reading list at the beginning of every month and – miracle of miracles! – I’ve done a fairly good job at sticking to it. I was pleasantly surprised at how much easier it is to pick up a book and start reading when I’ve already decided what books to prioritize at a given month. Turns out there is a real benefit to trying to stay organized. Who knew? Honestly, I’m kind of looking forward to reading the books I’ve lined up for April. I keep forgetting that I have so many promising titles hidden away in my TBR shelves. Alright! It’s my turn to talk about Reno Ursal’s Enlightenment, the first book of the Bathala series and, boy, do I have a lot to talk about. At the risk of sounding cliche, I was pretty enlightened after reading this book and I can’t thank the author and Kate for giving me this opportunity. First and foremost, let me tell you a little bit about the book. 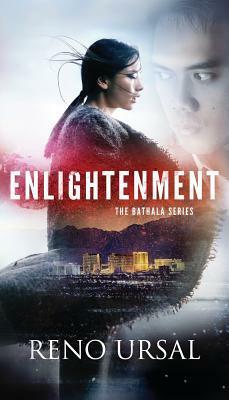 Enlightenment is the first book of The Bathala series. Set in the weird and dry desert lands of Las Vegas, United States, the book is about a young second generation Fil-Am (Filipino-American) girl Dorothy Dizon who despite seemingly having it all – straight A’s, an athletic build, a loyal and loving best friend – is actually slowly losing everything she knows about her life. Her mother is dying of cancer, her father has gone and left them years ago, and, to top it all off, Dorothy realizes that she actually knows very little about her mother’s home country and even less about her bloodline. Things get weirder when the new kid, a Filipino transfer student named Adrian, befriends her. Dorothy starts having paranormal experiences around the mysterious Adrian and the more she tries to look for answers, the more her life is at risk. Some reviewers have likened this book with Rick Riordan’s mythology adventure series since Enlightenment brings Filipino myths and creatures in modern times but if you’re a veteran reader of young adult books, you’ll recognize that this book feels more like a YA paranormal/fantasy romance a la Melissa dela Cruz. Secret magical society, chosen ones, mystic dream sequences, inexplicable magical elements, and, most importantly, a hunky male main character that’s destined to protect the female lead – the recipe for a lot of YA paranormal romance in the past decade. Hello friends. I’ve been meaning to go back to my roots and write book reviews for this blog again but, honestly, most of the books I’ve read so far into 2019 haven’t really given me enough to dedicate a whole post about them. Oh, I’ve read plenty of 5-star books and a handful of 2- and 1-star books but for some reason, whenever I sit down and actually try to draft a review of an individual book, I get discouraged. I worry that I’ll just reiterate what other reviewers say. As you know, a book has to be especially good or especially bad for me to want to write a full blown review of them. Ironically, both The Wicked Deep and Daughter of Smoke and Bone are neither. However, the two books were surrounded by a lot of hype when they first came out and even held a lot of promise at the beginning. When they inevitably disappointed me, I was especially stung. That’s right, this series is officially a thing that I do on my blog now. The first Sequel Sunday of mine wasn’t just a fluke that I can surreptitiously bury with each passing month. 2019 is the year I actually try to challenge myself to write better and more frequently. Since it’s the first day of the month, I figured that I should at least try to start it off right. And what better way to do that than by reviewing the first two months of the year in a loose and casual personal post. It’s weird because 2019 so far feels like it’s gone on for much longer than two months but at the same time like not much time has passed at all. A real paradox, I say. Growing up, I didn’t always know that I was aromantic. I didn’t even know that people could be wired to not feel romantic attraction to anyone. All I knew was that I was different from my sisters and my girl friends and most of the people around me. I mean, in the Philippines, there’s so much value placed on romance and romantic relationships. There’s literally a word that encapsulates romantic excitement, kilig. Everywhere you look, romance is, well, romanticized. Our cinemas and TV networks are perpetually saturated with rom-coms or romantic dramas; celebrities can literally capitalize on their will-they-won’t-they relationship with another celebrity (known as “love teams”) for years (seriously you can build an empire out of a lucrative love team alone); our music industry is flooded with songs of heartbreak and heartache so much that it’s hard to find a song that deviates from that; really, I can go on for days. In a culture that literally commodifies kilig,you can imagine how difficult it was for me to figure out my own identity when I realized (very early on) that I didn’t seem to feel what most of the people around me felt about romance. I’ve never even felt kilig. Ever. I’m currently loading up on more Asian books to avoid such a dark fate but, in the meantime, I feel like I should talk about the books that I have read. I’m thinking of writing these mini-reviews every month or whatever. It’ll be like killing two birds with one stone – I get to write more book reviews (which, weirdly enough, I rarely do unless the book is super good or disastrously bad) and I can have somewhat regular #YARC2019 update post. I was lucky enough to have started the challenge with a spectacular and thought-provoking murder mystery, Smaller and Smaller Circles by F.H. Batacan, followed by an epic crime family drama with a fantastical twist, Jade City by Fonda Lee, and, just recently finished a YA contemporary that I have mixed feelings about, A Line in the Dark by Malinda Lo. Nine years ago, I read Suzanne Collins’ The Hunger Games, the first book of the genre-defining trilogy. It was one of the first YA dystopia books that I’ve read and arguably one of the best. Well, I’m remembering the book with nostalgia glasses on so, naturally, I only recall the good. But I digress. Although it’s been a decade since I read that book, I still distinctly remember its incredible finale. I remember how my heart stopped when, after defeating the last Tribute with the promise of both Katniss and Peeta winning together, the Gamemakers amend their their previous rule change just to squeeze in one last dramatic twist to the Hunger Games. I remember the gut-wrenching visual of Katniss and Peeta looking at each other, realization dawning on them of what the Gamemakers were telling them to do. And I remember that absolutely victorious moment when the two characters force the Gamemakers to take back their amendment by choosing to commit suicide together than kill the other. Say what you will about the trilogy but that right there was some straight up tremendous writing. That ending worked so well because the conflict between Katniss and the Gamemakers (and, in a way, the totalitarian government of Panem) was steadily brewing all throughout the story. Katniss’s provocations against the Gamemakers grew bolder and bolder, culminating into the ultimate act of defiance. Certain scenes even foreshadowed the ending. The Hunger Games was skillfully crafted to have achieved such a powerful conclusion. I will always remember that ending no matter how many books I read in my lifetime because there’s just something so poignant about a young girl whose entire life was governed by a power she could never hope to fight back yet actually triumphing in the end. Ruthless Magic, in comparison…. well, let’s just say that even though I reread it just recently, the ending is already swimming out of focus and I have to consult my timeline notes to jog my memory.